The data presented here is the result of analysis and testing by UUC Motorwerks. All information is considered correct at time of publication and represents repeatable and verifiable information. What makes the UUC Motorwerks Ultimate Short Shifter so good is that it uses the best custom parts and addresses the "problem" areas of the factory design to give you the smoothest and most precise shifting possible in a BMW. There are other BMW short shifters on the market which is a good thing...it makes our product the easy choice. Go directly to the in-depth description page. This kit has a US retail price of $1050 through CEC. The ACS kit has a new CNC'd carrier, as well as a new shifter lever. Interestingly enough, it uses a shifter manufactured by the same company that makes BMW's original shifters, which can lead to the same issues of slop and mushiness as the shifter that came in the car. The kit has limited applications (mostly to E36 M3s) and installs in anywhere from 1 hour to 3 hours, depending on your level of mechanical ability. Instructions are minimal. The shift knob sits about 1" higher than stock. UPDATE: Schnitzer has recently outsourced the manufacturing of their shift lever to Valeo, the original equipment manufacturer for BMW. Construction is identical to the original BMW lever with modified dimensions. A nice overall product but afflicted with the original problem of a plastic shifter ball. Lever will flex and bushings will wear like original lever. UUC Motorwerks 5.75" 3.5" 3.0 lbs. 5.75 lbs. 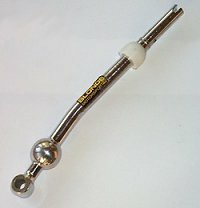 B&M recently posted a significantly inaccurate and misleading comparison of their new shifter product in comparison to our UUC product. Read the truth: click here. Note that many B&M shifters are a solid-metal design that will definitely transmit substantial vibration and noise into the cabin. Central pivot cup does not securely attach to original carrier, it relies on the friction of two rubber O-rings and a side-sheared clip to hold in place. That means that it is possible to pull the assembly out while driving. Central pivot components are not self-adjusting and loosen due to use, resulting in a buzzing and clicking. Plastic lower pivot bushings will wear and loosen, worse than original BMW bushings. Material selection for this high-load part is inappropriate for the forces of the BMW selector rod. Independent user review: Evo3 vs. B&M comparison - click here. Independent examination of B&M - click here. This kit is also sold under various names in different catalogs. Retailing from $185-$270, this kit has been around for quite awhile. Unfortunately, the problem with this kit is that it uses BMW's older, discontinued two-piece lever design, and it uses BMW clips to hold it together... the same clips that used to loosen up on the BMW shifters which is why BMW discontinued them in the first place. This older-style two-piece shift lever can loosen up and has been known to come apart during shifting. 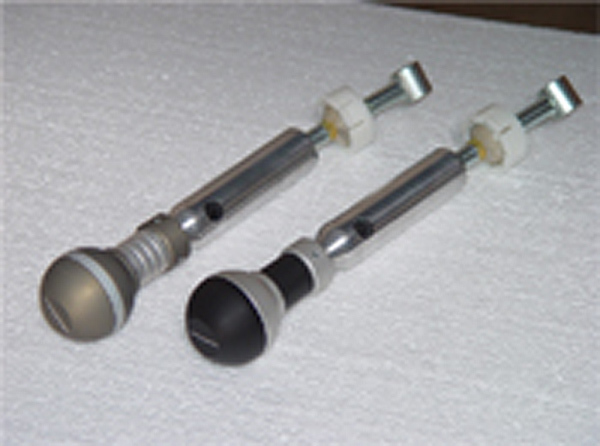 Depending on which version purchased, Auto Solutions' basic kit uses a factory upper, shown on the picture on the left resulting in a higher shifter position in many models. Here's a quote from Autosolutions: "Since the Upper lever is insulated from the lower lever (steel portion with the pivot ball) with a resilient material -typically vulcanized rubber- some flex will occur at the upper lever." Their alternate version is fundamentally identical, with the exception of machined aluminum upper sections (shown in red to left and silver - upper right). These versions have the benefit of being at the right height. Whereas the kit claims "zero clearance bronze bushings", our slightly used sample has more play than than a factory shift lever. Metal-on-metal pivots are a bad idea. Even their newly designed kit showed signs of wear after only a few weeks. As a soft metal, bronze isn't so great as a "pivot" material. It is also odd in that it offers a replacement selector rod for no functional reason. The factory part is made of steel and does not wear out... but we've seen many examples of this replacement bronze selector rod wearing against the bronze bushing in the lever, and also wearing against the steel clip. Installation, from the instructions provided, requires professional assistance, incredible patience, and professional tools. You are required to drop out the drivetrain and exhaust so it will take you at least 2-3 hours, if you're lucky. In all reality, this procedure is overly complicated and the shifter can be installed just like any other brand without removing these parts. Anticipate paying an independent service shop $200-$250 to install this kit if the AS instructions are followed. Every part made by Autosolutions, excellent quality machining.. Extra parts made by Auto Solutions (why replace good factory steel parts with soft bronze?). Over-size shifter ball adds to shifting effort and wears out bushing faster. Increased effort in shifting and notchiness. Unnecessarily replaces shifter linkage rod. Why buy parts that you don't need? Very difficult install with selector joint replacement. Requires removal of driveshaft, exhaust, and guibo for installation. Clipped-together shifter lever may vibrate or separate (user reports indicate this happens while driving). Recently imported from Europe, this kit is nothing other than an original BMW shift lever from another model with different dimensions. 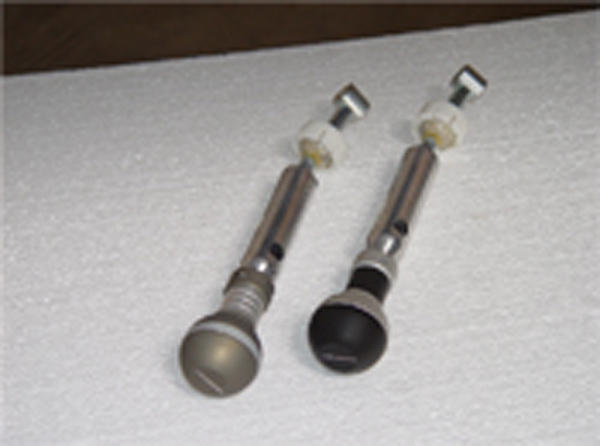 See section on BMW original shifters for more details. This kit does include a nice shift knob for $299. As any replacement BMW original shifter typically retails for $37, that knob's cost is $262. No linkage re-alignment causes increased effort, notchiness, and guibo interference in some models. Factory lever will have flex and bushing wear. Korman has a short shifter kit which is comprised of only a shift lever. It has an adjustable pivot ball which will allows the user to "dial in" the level of shortening you want. It sold for approximately $210-$220 and fits E36 and some E30s. Currently, Korman is having a "clearance sale" at $169. Korman provides some factory BMW bushings as he expects you to destroy the original cup which holds the shifter. This lever appears to be a threaded rod with a welded part on the bottom (for the linkage arm), clipped to an old style factory upper lever. BMW used to make levers this way a long time ago, but have since gone to the one piece method - the clipped-together shifters loosen up and may come apart. There are marks on the threaded rod indicating that it has been bent in some manner (the threads are squished). It has 3 little allen screws which hold the ball in place once spun into position. Adjusting the height also radically changes the shift throw, resulting in increasingly higher effort to shift. The other thing which is not clear is how someone could be expected to adjust their pivot ball easily... to do so with this shifter would require complete removal of the unit. A good concept, perhaps, but since it requires shifter disassembly to implement, it is not viable in our opinion. Additionally, changing the reduction forces a change in shifter height. This product also suffers from the problems of a plastic shifter ball. No tool to remove cup. They expect you to break it taking it out. Common complaint of adjustable ball coming loose. Back in the market, Blonde Motorsports is back marketing again as we saw the ad in a recent Roundel magazine. They offer a kit for $189 which includes a "one piece lever", a knuckle, cup, and linkage rod. Unfortunately, there is no mention about how much throw is reduced. Lightweight lever will transmit a lot of vibration. This sort of kit retails for $99. The kit is a simple aluminum adapter which relocated where the lower linkage arm attaches to the bottom of the shift lever, increasing it's leverage. In theory, it's a good idea. In application, it's not the greatest... the lower plastic bushing isn't very snug when new and wears out rather quickly. Owners of this adapter tell us that their shifter gets sloppy very quickly. Installation is about an hour, with instructions that are poor. Overall, the shifts are shorter, but a common complaint is that the shifts are sloppier. Click here to see what www.MZ3.net had to say about it. Adds additional play into shifter, increases sloppiness in shifting. Many companies offer a shifter that is simply a factory M Roadster or other 3-series lever (BMW retail $37). The only modification to this shifter is a simple bend and cosmetic polishing. BMW levers inherently have flex between the two sections, and despite crimping to strengthen this, they will still loosen up. The plastic lower pivot bushing is another area of slop that will return, and even worse, has a plastic pivot ball that gets rough with use as the miles add up. 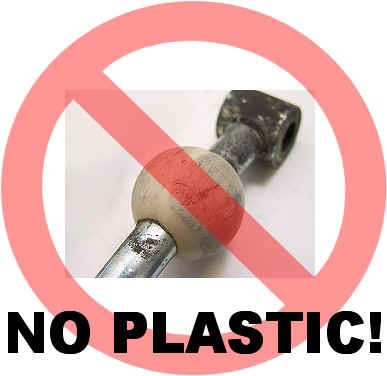 Click here for more details on why plastic pivot balls are a bad idea. Think about it - if your original lever got sloppy, wouldn't a replacement factory lever get sloppy too? 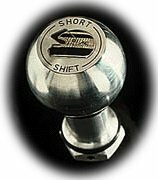 Shortened factory shifters present some critical problems. Besides suffering from all the problems of a simple factory lever swap, this sort of "conversion" involves damage to the lever that permanently compromises the structural rigidity. Breaking the original rubber bond cannot be repaired properly regardless of adhesive. This is a "DIY" job that is better left to the Hyundai crowd. Even worse, this sort of hacked-up shifter is promoted as being the "ideal height"... as valid a concept as saying that every person should be the same height. Factory lever structurally weakened will loosen and have flex and bushing wear. Height reduction too short for most drivers (this mod should be used for Z3s only). 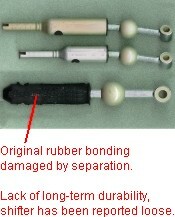 Plastic pivot ball and plastic lower pivot degrade rapidly.